This week, I have a very special Soundtrack Saturday track for all of you that comes from a film made y one of my directors based on a book from one of my favorite authors. When I was in school, S.E. Hinton was one of my favorite authors thanks to books like The Outsiders, Tex, That was Then, This is Now, and one of my personal favorites in Rumble Fish which I read while in school. In 1983, Francis Ford Coppola teamed up with S.E. Hinton and he directed two films with the first being The Outsiders and the second being our feature film for today in Rumble Fish. The film starred Matt Dillon, Mickey Rourke, Diane Lane, Dennis Hopper, Nicolas Cage, and Vincent Spano while Francis Ford Coppola also handled the soundtrack duties (well to a point, don’t worry I’ll explain). Coppola envisioned a soundtrack or a score that was going to be experimental to go along with how different his film was and to go along with the images of the film. So, he went out and he hired The Police drummer Stewart Copeland to help do the score. After a while, Copeland was doing such an amazing job with the score that Coppola stepped aside and he let Copeland do his thing. 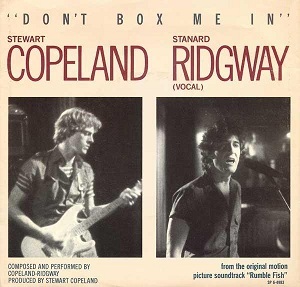 For our featured track today Don’t Box Me In, Copeland sought the help of Wall Of Voodoo singer Stan Ridgway to help sing on the track and he also plays harmonica on the track too. The song really is the best of both worlds as you get a mix of The Police with Wall Of Voodoo in the track itself. Check it out for yourself below and if you are on Facebook, check out our page right here and give it a like while you’re at it.